Arria Minor made the most of the first outdoor meet of her senior year. All eyes were on Lane 4. Arria Minor sat crouched. Her long hair dangled beyond her shoulders while her orange painted nails sat just behind the thick white line. Her eyes caste downwards at the bright red track while she waited patiently for the starter's gun to send them off the line and into the familiar territory. At first glance the eight competitors crouched on the starting line of the girl's 100 appeared to be even, anyone has a chance. But the reality was sitting in the blocks was as close as anyone would get Minor. Just minutes before Minor was warming up in black tights and a matching black sweatshirt with "GEORGIA" in red across the front. She oozed confidence as she made her way through her routine, one that's become familiar over the years. Competitors and spectators alike stole glances at Colorado's sprint queen, who's clearly become a Titan among mere mortals. So at second glance, it had to be a little intimidating sitting in the blocks next to Minor. When the gun shot off, so did Minor, business as usual. She tore down the track to cheers of her name, business as usual. And when she neared the finish line, she didn't even lean, she just sprinted right by, business as usual. When she eventually slowed to a jog the clock read 11.78, a new state-leading mark, and it was into a slight headwind. It was perhaps the theme of the day for Minor, who was racing for the first time since rewriting the Mountaineer Field House record books in Gunnison last month. The future Georgia Bulldog didn't waste anytime finding her stride on the gray day at Denver South Thursday afternoon. Minor raced through the line of the 100 in the same way she raced through the meet, business as usual. While most of Colorado's best have their sights set on the middle of May, she's got her sights set much further than that, as she's bound for a busy post-season. And like she said a month ago, it's a long season. 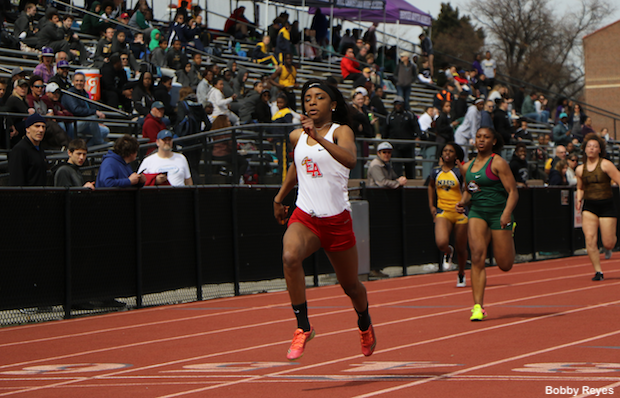 While Minor was quick to fall back into the same stride that's taken her to too many wins to count, the Denver South Rebel Invitational saw plenty of big performances, and a slew of new faces to the front of the pack.